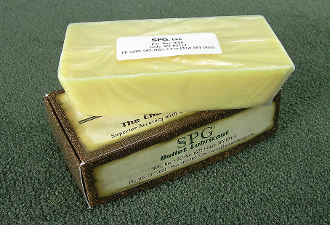 Classic SPG Lube in a 6 pound BLOCK: for pan lubing or lubrisizers, GREAT FOR BLACK POWDER AND SMOKELESS. You've tried the rest... now try the best. SPG Lube has been used by more Black Powder Champion Shooters than any other bullet lubricant. With all the variables in cast bullet shooting, isn't it great that you only need ONE bullet lube? 10 shots - 1 5/8 inches, farthest holes .40-65 Ballard, 200 yds., 10X scope, double rest, straight blackpowder, no cleaning. SPG Lube is available in ½# pound bricks, suitable for pan lubing or melting in a double boiler. SPG lube can be poured directly into your lubri-sizer or bullets may be dipped directly in the hot lube. The lube must be allowed to set up completely, before you use it. These bricks are sealed in plastic and are shipped in a heavy cardboard box. We recommend that the bulk lube be stored in an airtight container, such as a Ziploc bag. A clean jam or jelly jar works very well for melting the lube in a water bath. The jar can also be used for storage after the lube is melted. SPG Lube can be heated and melted indefinitely, as long as a double boiler is used. We DO NOT recommend direct heat or microwave for melting the lube.